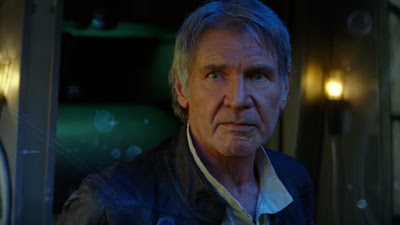 It's funny to see Harrison dodging the question of Han's "relationship status" (though did anyone really expect Harrison to know what Facebook is?) and discussing how much he was paid to do the original film back in 1976. It's been so nice to see Harrison having fun with Star Wars lately after so many years of avoiding it. It's painfully obvious that Han is no longer in a relationship with Leia. Because you can't have a strong independant woman married to a man on film in today's world! Which is plain wrong and a massive let down. Speaks volumes about the direction star wars is heading. Me no likey.